Discussion in 'Non-India Related Domains' started by Prashant Sharan, Apr 15, 2019. Let's look at the market's performance on 12th April, 2019. The top sale of the day was IA.de which sold for $62,234 at Sedo. NameBio recorded 307 sales $100+ for a total of $199,410 with an average sale price of $650. Compared to the previous day there was an increase of 15% in the number of sales and the total dollar amount increased by 2%. We also recorded an additional 1,177 sales below $100 for a total of $31,024. The domain Academy.tv sold for $1,025 at Dynadot for an increase of 402%. It last sold for $204 on April 12th, 2018 at Dynadot. 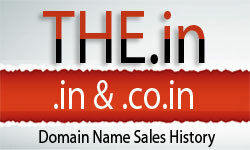 The domain Hg212.com sold for $1,227 at GoDaddy for a decrease of 55%. It last sold for $2,710 on April 15th, 2016 at NameJet. The domain Cosing.com sold for $359 at DropCatch for a decrease of 69%. It last sold for $1,150 on August 1st, 2014 at Fabulous. The domain GameMafia.com sold for $400 at GoDaddy for a decrease of 87%. It last sold for $3,000 on July 6th, 2015 at BuyDomains.